More than 100 years ago, his­tol­o­gists had already detected “fibers” within cells includ­ing the mitotic spin­dle and gen­er­ally recog­nised the exis­tence of a “cytoma­trix”, although there was much con­tro­versy about whether or not the fibers observed were cre­ated by chem­i­cal fix­a­tion. As a result of the appli­ca­tion of elec­tron microscopy in the 1960s and espe­cially flu­o­res­cence microscopy in the 1970s, it became clear that ver­te­brate cells gen­er­ally con­tain a struc­tural frame­work com­posed of three types of pro­tein poly­mers: actin fil­a­ments, micro­tubules and inter­me­di­ate fil­a­ments. Together this net­work has been termed the “cytoskele­ton”. Unlike the bones of the skele­ton that sup­port our body, the poly­mers of the cytoskele­ton are con­tin­u­ously assem­bled and dis­as­sem­bled to mod­u­late the form and inter­ac­tions of cells, accord­ing to their spe­cific func­tions. 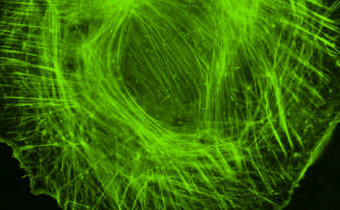 We will be con­cerned here with the role of the cytoskele­ton in cell move­ment and related motile processes. The fil­a­ment sys­tems of the cytoskele­ton that can be observed in the flu­o­res­cence micro­scope and in the elec­tron micro­scope. 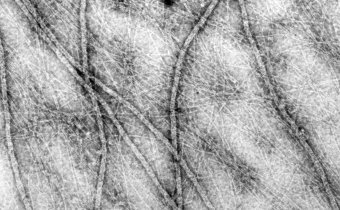 The actin cytoskele­ton is com­posed of dif­fer­ent arrays of actin fil­a­ments, organ­ised in net­works and bun­dles.